On September 25th, Montalvo Arts Center’s historic Villa – nestled in the foothills of the Santa Cruz Mountains – will be the stage for an extraordinary culinary happening: the US premiere of “Experimental Gastronomy” presented by Steinbeisser. For this unique dining event, renowned Bay Area chefs David Kinch, Corey Lee, and Daniel Patterson will come together to create an entirely plant-based menu with locally grown organic ingredients. Montalvo provides the location: a magical place of beauty where lush nature completes the sensory experience. To heighten the culinary adventure, the meal will be served on dishes and with cutlery crafted by some of the country’s most innovative decorative artists. The event will be a truly unique experience that not only showcases contemporary cuisine at the highest level, but also puts design, gastronomy, and nature in an exciting and inspiring context. 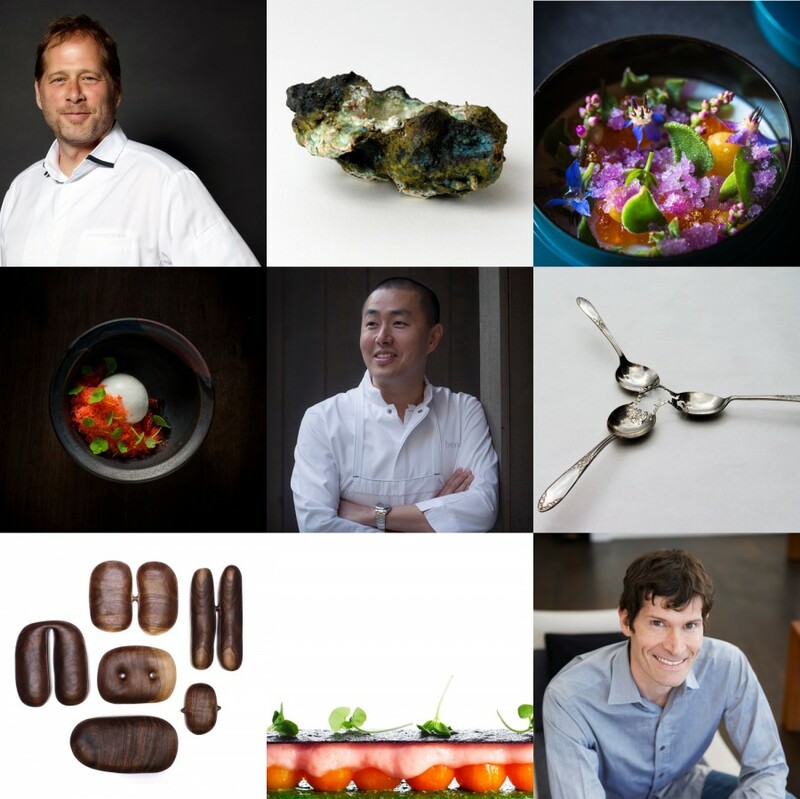 David Kinch, chef at 3 Michelin star Manresa; Corey Lee, chef at 3 Michelin star Benu; and Daniel Patterson, formerly chef at 2 Michelin star Coi; join forces for this vegan dining experience. Their style is unmistakable: clear and elegant, courageous and cheerful – an expression of contemporary creativity. For this occasion, the three chefs will be using exclusively plant-based (vegan) ingredients sourced from Biodynamic or organic farms in California. Manresa’s Pastry Chef Stephanie Prida will be in charge of the dessert creation, while Manresa’s Master Sommelier Jim Rollston, Benu’s Master Sommelier Yoon Ha, and Coi’s Mark Mendoza will be curating the wine pairing. Twelve different artists and designers have been invited to create the cutlery and tableware. Inspired by nature, their extravagant cutlery and dishes are created out of wood, clay, earth, metal, sand, stone, and porcelain. Their curious and fearless approach adds another, surprising dimension to the culinary experience. Artists Brian Weissman, Erin Daily, and Sergey Jivetin will craft the cutlery: peculiarly unpractical and yet unexpectedly usable pieces that combine old and new materials. Artists Erica Iman; Nate Mell and Wynn Bauer from Felt + Fat; Jessica Hans; Joseph Pintz; Julian Watts; Luke Shalan; Mitch Iburg and Virginia Scotchie will shape quirky bowls and plates. For example, Sergey Jivetin’s re-engineered optical devices aim to engage the participant in the tactile experience of wonder, pleasure, luxury and preciousness. Joe Pintz will craft a series of serving dishes based on garden shovels, offering us a glimpse into how our attitudes toward labor and food continue to evolve. Through a performative, process-driven practice, Luke Shalan uses porcelain to archive objects, by allowing gravity to take control over the process of creation. And Jessica Hans adds foraged rocks and minerals into her clay body and glaze for a more visceral dining experience creating the sensation that the diner is eating directly from the earth. In an age of ever-increasing speed, the dinner table is the perfect place to slow down and share food that is made with integrity and purpose. Serving this sustenance in handmade cutlery and vessels not only amplifies our experience, it allows us to develop a deeper relationship to food and with one another. The location is also part of the composition. Instead of a restaurant, the dinner takes place in Montalvo’s 104-year-old historic Villa. The Villa transforms into an exclusive venue where guests find themselves surrounded by nature. The view from the Villa terrace down the Great Lawn into the Italianate Garden with its cypresses, citrus trees, and rose bushes, is one of the greatest landscape vistas in the Bay Area. Steinbeisser challenges the contemporary eating culture. Founders Jouw Wijnsma and Martin Kullik have spent the last four years organizing avant-garde culinary evenings in Amsterdam, Berlin, and Frankfurt, now for the first time in the US. Each event is a unique experience where renowned chefs and international artists come together to realize a one-of-a-kind creative, gastronomic happening. Food and drinks are always entirely plant-based (vegan). In addition all ingredients are sourced from Biodynamic (Demeter) and organic agriculture in the direct surroundings. Price: 7 course tasting menu with wine or juice pairing $700. Dates: Sunday September 25 at 6:00 pm. Location: The Villa at Montalvo Arts Center – 15400 Montalvo Rd, Saratoga, CA 95070. For detailed driving directions please click here. Reservation: Visit montalvoarts.org/experimental or call 408-961-5858. The office hours are from Monday to Friday, 10:00 am to 4:00 pm. You can find and follow us on Facebook and Instagram.